Last time we have shown how easy is publishing SAP datasets to Tableau Server as new TDE data sources with VirtDB Data Unfolder. But it was a manual action on a static dataset only – the currentness of the published extract will drop quickly. Let’s see how to keep SAP data extracts continuously fresh on Tableau Server! In the SAP client push the Data Unfolder button, just over the data grid of any VirtDB enabled datasets (reports, tables, views, queries, …). 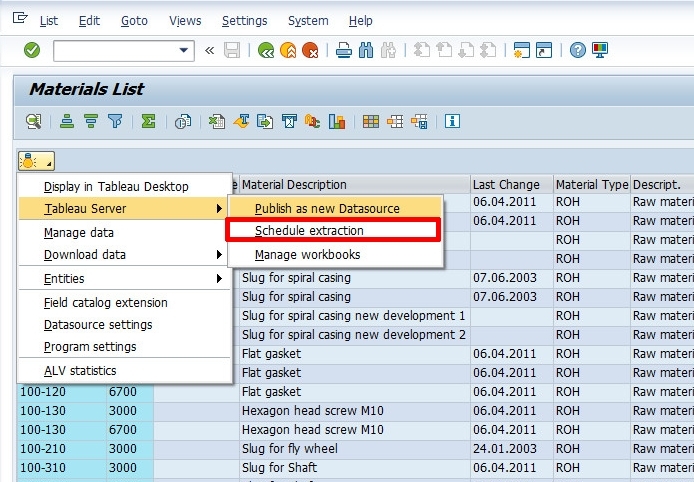 The second option under “Tableau Server” will be “Schedule extraction”. It will open up a dialogue window to specify the data source name (we use the *_BATCH naming convention just to differentiate the automated TDE extracts from the manual ones) and the Tableau project you want to associate the extract with. If you hit OK, it will open up another form to fill in the schedule / automation parameters. You have to choose if it will be a one-time job execution or periodical batch. If periodical, further informations are required (like when to start, on what days, special calendars to use, etc.) by the SAP background job processing engine to set up the schedule. 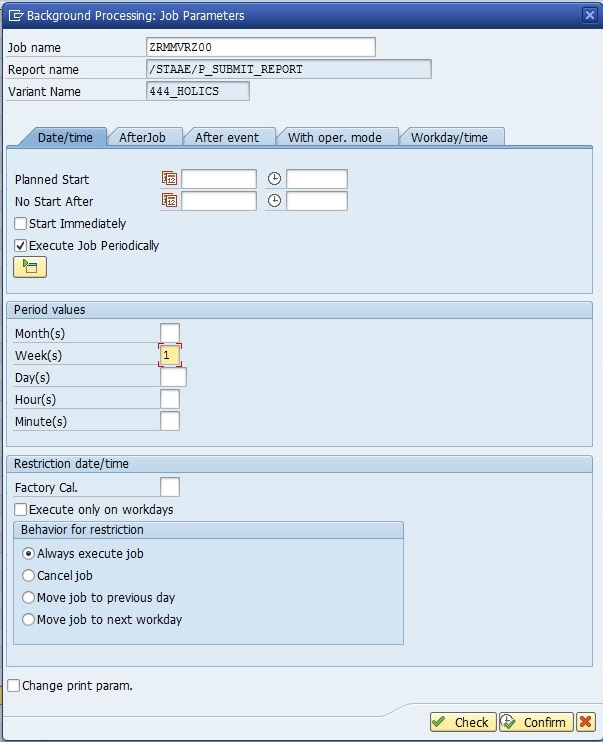 Once confirmed, you can inspect the job execution status and the detailed logs (after the first execution passed) in the SAP Client – you should see something like this. Now if you go to the Tableau Server Data Sources page, will see the new data source published already. Great, you have just set up a periodically refreshed SAP data source on your Tableau Server – without writing a line of ABAP code or begging your manager for SAP development budget. 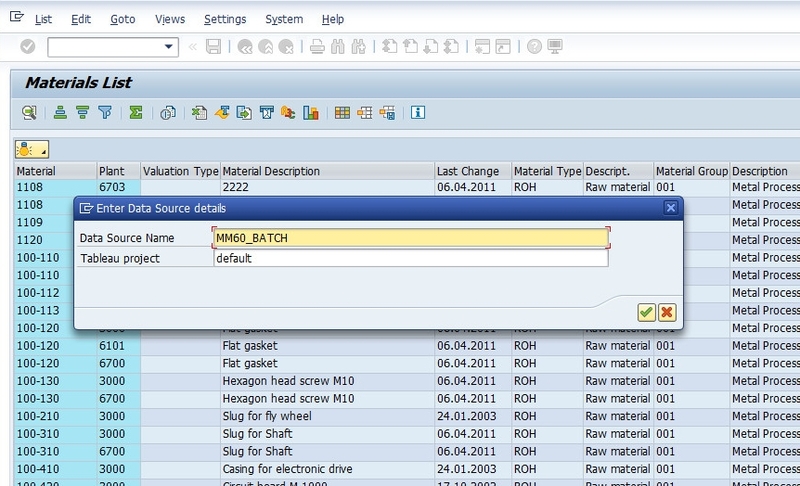 And you can do this with any SAP data sets you need, standard or custom. Isn’t it nice? 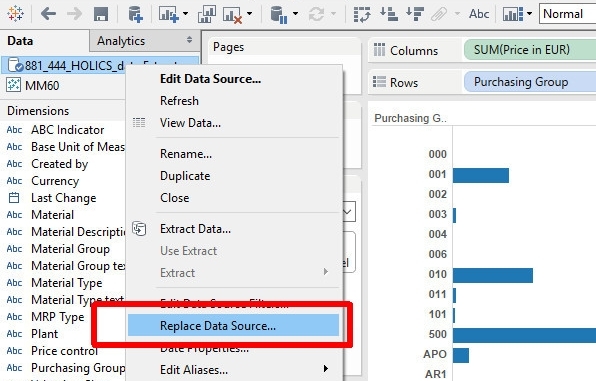 If you have workbooks already created with Tableau Desktop on static SAP data, you can simply replace the data source under those reports by using Tableau’s replace data source feature. Have fun with your SAP data!